Have you been looking for fun and different craft projects to do with the kids? 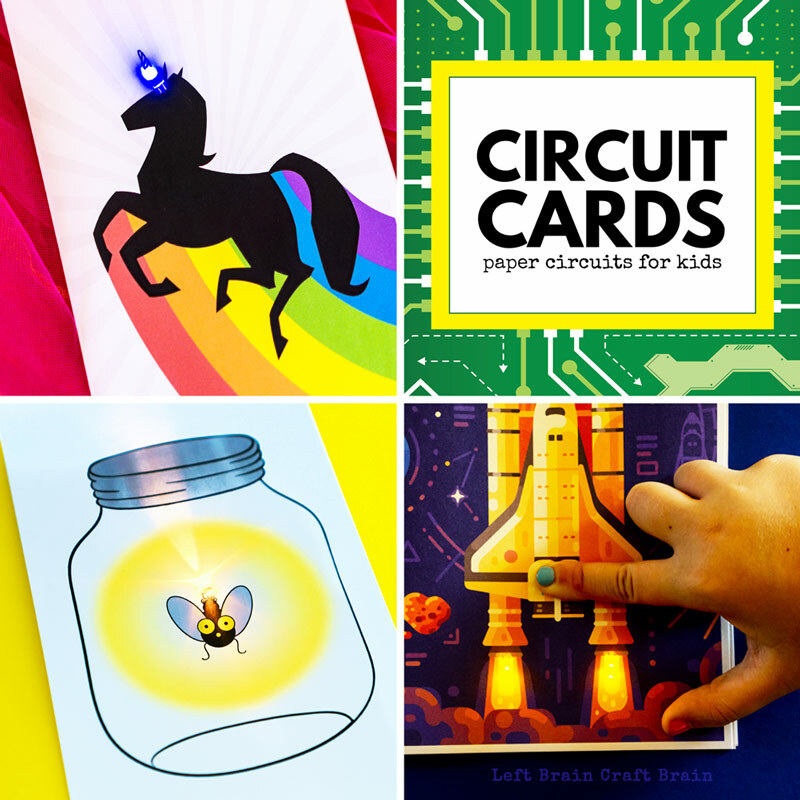 Try paper circuits! 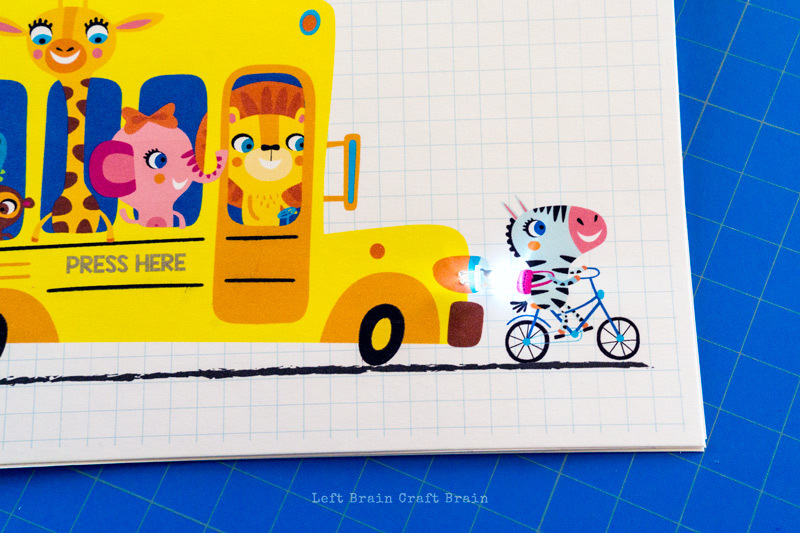 They’re a great way to learn about electricity while making a fun paper card. 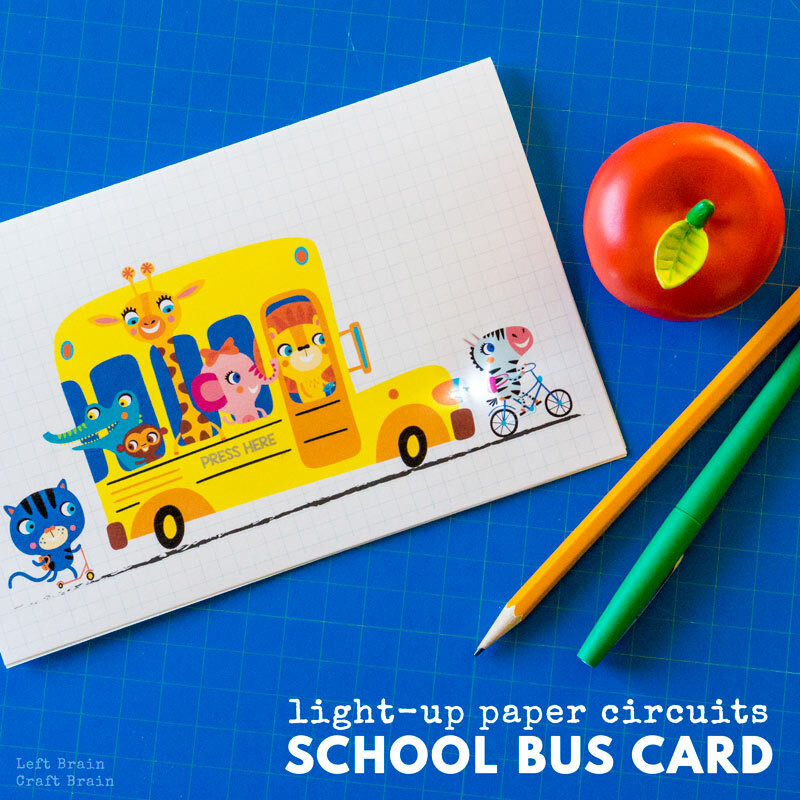 We love playing with circuits around here… We’ve made Valentines and lightsabers, and this Light-Up Paper Circuits School Bus Card is one of our favorites. 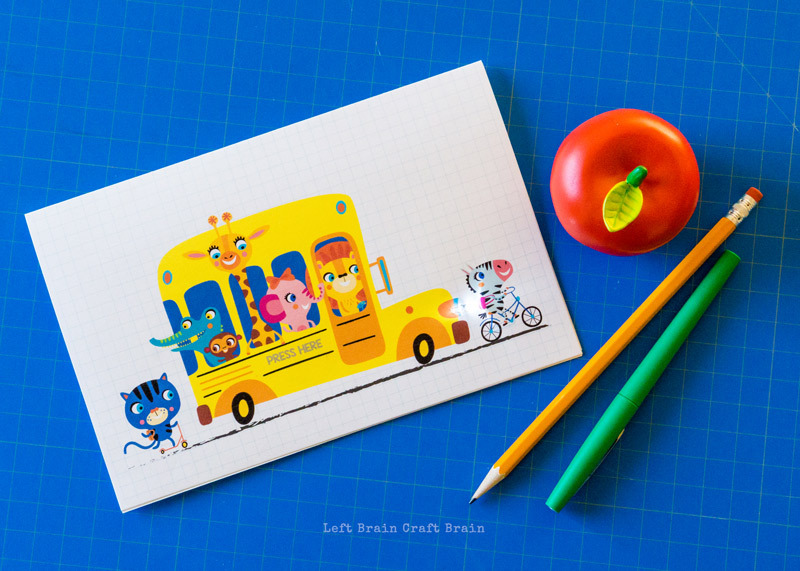 It’s perfect for celebrating Back to School in class or at home or anytime that one of your kiddos needs a quick pick-me-up craft. Paper circuits are a way to build electrical circuits without wires. They use copper tape, LED bulbs, and coin cell batteries to create the connections. A circuit is a closed path or loop around which an electric current flows. If the circuit is complete, it’s called closed and the bulb will receive power and glow. If the path is broken, the circuit is open, and the bulb will stay dark. SAFETY NOTE: This activity is intended to be performed under adult supervision. Coin cell batteries pose a special risk and usage should be monitored at all times. If you are unsure of the safety or age appropriateness of an activity, please consult your child’s doctor. First, download your printable template and print on white cardstock. You will need two pieces of cardstock. 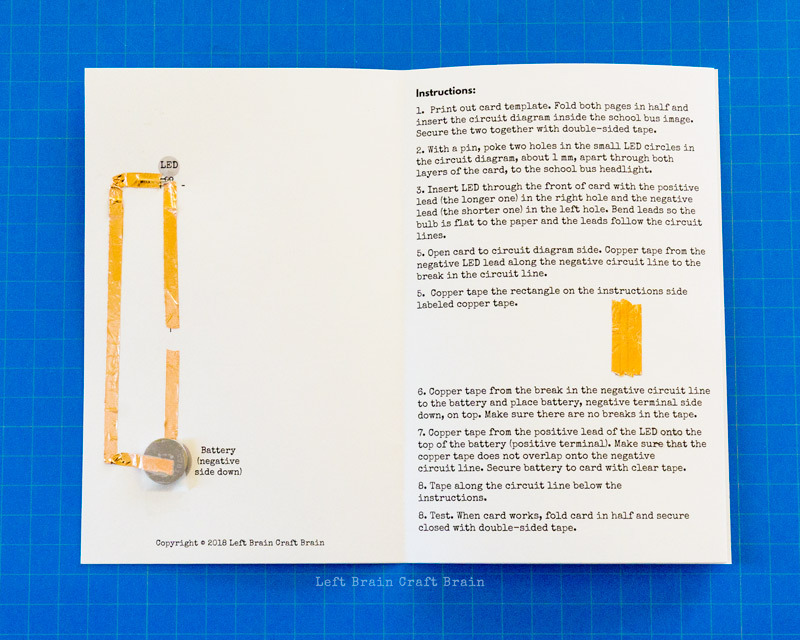 Fold both pages in half and insert the circuit diagram inside the school bus image. Secure the two together with double-sided tape. With a pin, poke two holes in the small LED circles in the circuit diagram, about 1 mm, apart through both layers of the card, to the school bus headlight. Insert LED through the front of card with the positive lead (the longer one) in the right hole and the negative lead (the shorter one) in the left hole. Bend leads so the bulb is flat to the paper and the leads follow the circuit lines. Now it’s time to build the circuit! Open card to circuit diagram side. Copper tape from the negative LED lead along the negative circuit line to the break in the circuit line. Copper tape the rectangle on the instructions side labeled copper tape. Copper tape from the break in the negative circuit line to the battery and place battery, negative side down, on top. Make sure there are no breaks in the tape. Copper tape from the positive lead of the LED onto the top of the battery (positive side). Make sure that the copper tape does not overlap onto the negative circuit line. Secure battery to card with clear tape. Test. When card works, fold card in half and secure closed with double-sided tape. We love making paper circuits in our house. So we made a whole book about them! 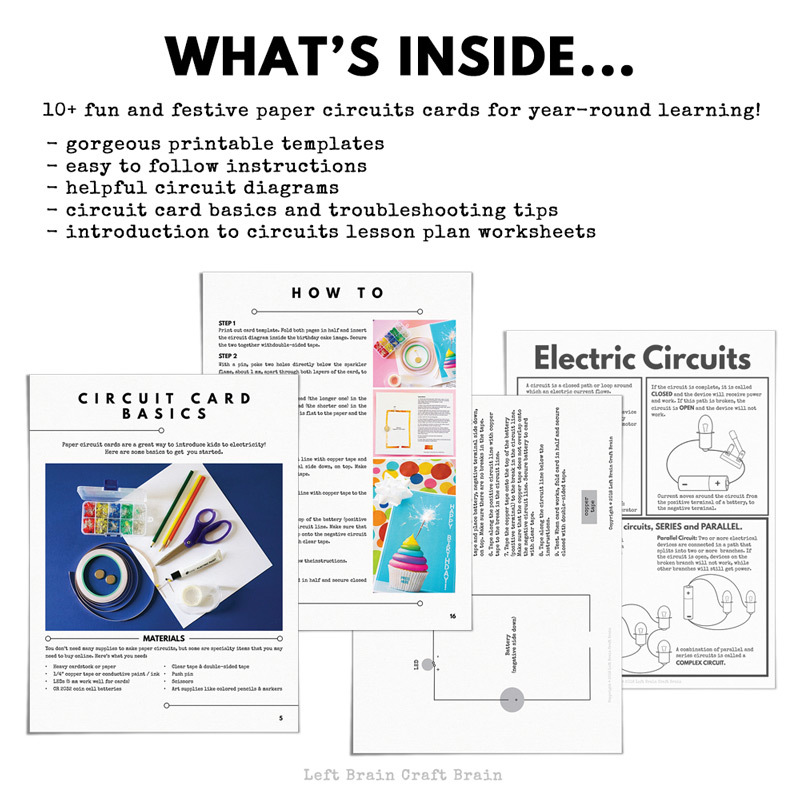 The Circuit Cards Paper Circuits for Kids Ebook contains 10+ printable and buildable paper circuits cards for holidays, special occasions, and year-round fun. 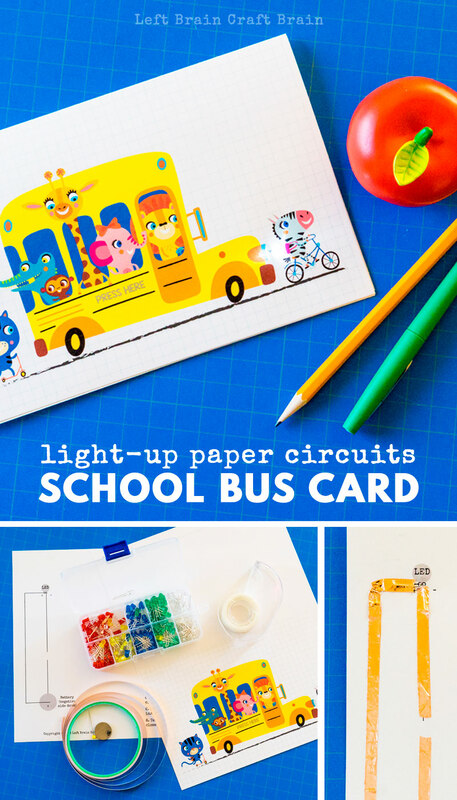 Each card contains a printable template and circuit diagram, plus easy to follow instructions for paper circuits success. Kids will love making a glowing unicorn horn, light-up cupcake cards for their friends’ birthdays, or Star Wars themed cards, too. 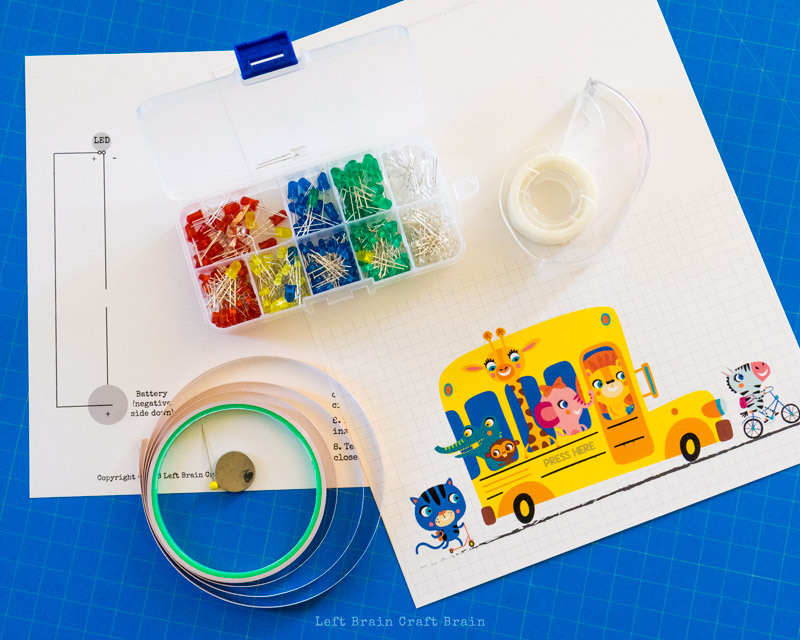 After working through some of the basics of how to build a circuit with a handy paper circuits lesson plan, they’ll love crafting their own ideas, too.